if i write a sentence with no capitalization…is it like nails on a chalkboard to you? When you see a dangling participle does it make you want to grab your scissors so you can snip it off? Put it out of its misery? Or do you roll with the bad grammar punches? Well, I can and I can’t. I read a lot of ebooks and the grammar errors in those books are wildly out of control. Do publishers not have editors for ebooks? Seriously. I don’t get it. I’m not the grammar police by any means. I make little grammar mistakes here and there all the time. I do try to catch them…but I’m not always successful. Case in point: the title of my last blog post has one too many “hows” in it. See? Not perfect. I do have one grammar pet peeve I need to mention though. It’s when people spell a lot as one word. How has this happened? 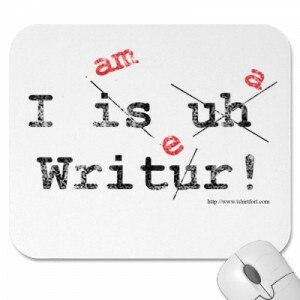 You don’t write, “I have abunch of carrots” or “She has acollection of books”. Anyway…that one really gets my inner grrrr going. Make grammar lessons fun! Oh, and read more! I know people far and wide lament the poor grammar that is out there. I think it could all be resolved if teachers would simply make grammar lessons more fun for students. Back to my point about making grammar lessons fun. The Oatmeal – as you may know – writes truly funny (and educational!) grammar lessons. His best one by far is on the proper way to use a semicolon. Have you read it? If not, go! Read it now! Come back and tell me it’s not funny. I dare you. I realize this particular grammar lesson The Oatmeal provides is perhaps a wee bit inappropriate for fledgling minds but my point is still valid. Grammar lessons can be fun. I do my best to catch grammar mistakes in my writing. I also fail every now and then. It’s inevitable so please be kind. When you come across one, let me know which grammar faux pas I committed. 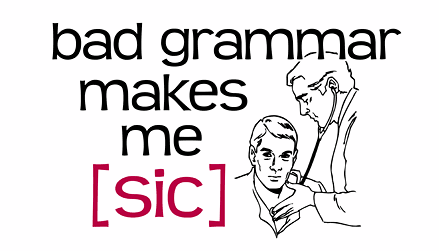 What’s a grammar pet peeve of yours? Or do you think it’s crazy to carry this kind of pet peeve around? like maybe i should let “alot” of it go. *wink. wink. * Ha! I kills me. Rather then telling you what my pet peeves are, I’ll show you. Theirs so many things out there that bother me and its literally impossible to include them all in one comment; but I’ll give it my best collage try. But anyways, your picking on the grammatically challenged and maybe we need to give them a break, yo. I’m generally pretty chill about the odd mistake or incorrect spelling, but if it is written by someone bragging about their writing skills or as an author-then I get a little stabby. I guess if I’m reading a published piece, I expect it polished. If it’s a blog, I’m more lenient. For some reason, there are just some rules that don’t seem to have sunk in, but I hope the grammar police let me go for minor infractions. Truth is, I find many people that go ballistic with their grammar criticisms make just as many errors or spelling mistakes as anyone else. The one word that I see EVERYWHERE that apparently no one knows how to spell (okay, this one DOES make me a little crazy!) is LOSE. Not LOOSE. Ugggggh. Tracey recently posted..Anyone Need A Girl Friday? LOL – the lose/loose one is killer funny to see at times. Can completely change the meaning of a sentence. I sooooo feel your pain. Thanks for writing about this Internet-wide problem. Here are three from my collection that you might enjoy. (I keep stuff like this in my notes under the heading “Bad English! Bad!”: These are so bad they make me grunt involuntarily. I told you it wasn’t pretty. There are plenty more where these came from. Ow, ow and ow. Hi Ken – thanks for stopping by! Love the bold face lie example…too funny. Ow indeed! Oh so true…then and than is a good one. So is except and accept. Argh.